Universal ANSI-C conform and hardware independent software library for the Ethernet POWERLINK protocol. The POWERLINK Library provides all required services for a compliant communication according to the POWERLINK communication profile EPSG DS 301 V 1.1.0 It facilitates easy and fast development of Controlled Node and Managing Node devices. The functional range can be extended by additional modules. Access to the hardware is carried out via a hardware abstraction layer. By the nature of POWERLINK it is necessary to obtain very short response times. Therefore these drivers are highly optimized and available for different Ethernet MAC controllers. Fastest response times can be achieved by using port’s POWERLINK FPGA solution, which is available for Altera Nios ® II and Xilinx MicroBlaze™. The FPGA solution can also be used for other Industrial Ethernet Protocols, e.g. EtherCAT, EtherNet/IP and PROFINET. An uniform user interface makes it easy to implement different protocols. The POWERLINK Library is based on ground of the POWERLINK V2.0 communication profile of the ETHERNET Powerlink Standardization Group EPSG. It provides the most importand services specified therein. It is completely written in ANSI-C and can be compiled with every ANSI-C compliant compiler. Depending on the required scope of functionality the POWERLINK Library is available in different expansion stages. With the standard Controlled Node version of the POWERLINK Library all services are provided for development of full-featured CN devices. The functionality of the Managing Node as well as the comfortable node monitoring functionality is provided by a different product. Additional services of other communication profiles are provided by means of extension modules. All hardware specific parts are decoupled from the POWERLINK protocol stack through a defined driver interface. This provides easy adaptation to different hardware platforms. The user application communicates with the POWERLINK Library through function calls and call-back functions. Configuration and scaling of the POWERLINK Library is done with the help of the POWERLINK Design Tool, which is delivered as POWERLINK Design Tool Light version. With it the POWERLINK Library can be tailored to an optimum to the available resources of the application. Besides the creation of the object directory all settings for the hardware can be carried out with it. The POWERLINK Library consists of a hardware independent and a hardware dependent part that communicate with message queues. The hardware dependent part consists of controlling software for the Ethernet MAC controller and timer functions. The application communicates only with the hardware independent part of the POWERLINK Library. That way it is possible to exchange drivers without any influence on the functionality of the application. The initialization of POWERLINK services is done with function calls within the application. During the execution of the application the POWERLINK Library executes all necessary communication tasks autonomously and informs the application about successful received POWERLINK messages with the help of callback functions. Communication requests from other devices as well as necessary periodical tasks and time out monitoring is handled within the POWERLINK Library. All requests are proved for correctness (access rights, data types etc.). The application is notified after completion of the communication and occurrence of failures, respectively, through service oriented callback functions. In these callback functions appropriate actions can be carried out from the application. The object directory is designed to contain references to the variables in the user application. Consequently it is possible to take over variables from an existing software without any changes in the object dictionary. The high degree of scalability of the POWERLINK Library is of particular importance for devices with limited resources. On one hand, this is achieved by the modularity in individual service groups, and on the other hand, through the use of compiler directives in the respective modules. Thus, the code size is proportional to the utilized POWERLINK services. Delivery of the POWERLINK Library comprises different example programs that describe the usage of the various POWERLINK services. All examples contain a complete implementation of a POWERLINK device including the object directory as well as application code. These are ready to be compiled and run. Among the detailed documented source code there is the reference manual and a printed user manual as documentation available. The POWERLINK Library is constantly improved and adopted to customer requirements. In order to keep up with the latest version of the POWERLINK Library port provides its customers an update service. For development, test and initial operation of POWERLINK devices port provides a comprehensive tool chain. The creation of the object directory is simplified with the POWERLINK Design Tool (POWERLINK Design Tool Light version belongs to the scope of delivery). The graphical POWERLINK Design Tool is available for the creation of the object directory, the electronic data sheet (EDS file in XML format) and for the documentation of the device in HTML or text format. The POWERLINK Device Monitor can be utilized for commissioning, but also for the implementation and test phase. For the development of POWERLINK application monitoring and analyzing the POWERLINK bus traffic is essential. The service oriented display of POWERLINK messages of the POWERLINK-REport allows easy and quick interpretation of POWERLINK messages. Besides the communication objects several application objects in different device profiles are also specified in POWERLINK. These definitions guarantee a defined behavior of the corresponding device class and enable the interchangeability of POWERLINK devices. Device profiles can be easily created by use of the POWERLINK Design Tool. In order to provide a quick and effective access to the development of POWERLINK devices we recommend to do the initial operation of the POWERLINK device together on the target platform. Customer experiences of his/her hardware, the used compiler and the experience of our engineers with POWERLINK and the POWERLINK Library can complement each other. This leads to reduced development times and a POWERLINK conform device. 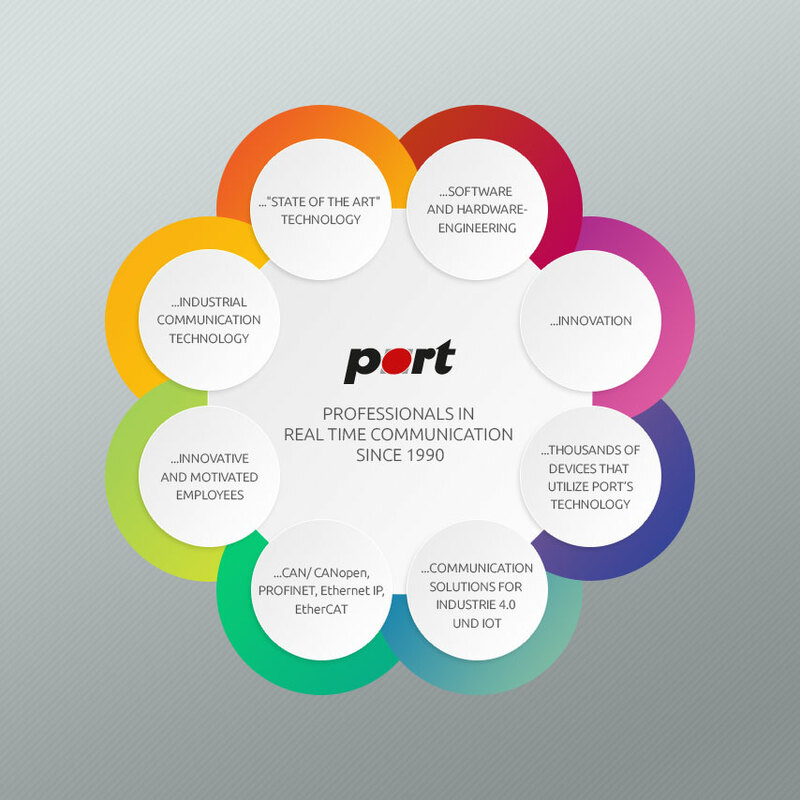 Trainings can be given at port or at your companies rooms and are exclusively carried out for your developers. This case is the most common use case, it allows for an excellent POWERLINK Performance and supports all outstanding POWERLINK features. In this scenario a Hub-IP Core ensures low latency and low jitter in the line-structure of the network. A special component PE²MAC (POWERLINK Enhanced Ethernet MAC) provides a Autoreply functionality, which basically answers Poll-Request from the MN almost instantly with the corresponding Poll-Response. This results in an overall excellent performance and specially low jitter. In a Soft-CPU in the same FPGA the POWERLINK Protocol is being managed and the customer’s application is running.